Osteogenesis imperfecta, or OI, is a family of disorders whose most obvious feature is fragile bones that are prone to breaking. There are many types of OI, but brittle bones and fractures are common to all of them. This is why OI is sometimes called brittle bone disease. The severity of OI ranges be mild to severe, with the mild form being the most common. OI is formally classified into groups numbered from 1 to 5 (1, 2), with type 5 added in the early 2000s (3). Many groups also have classifications with additional forms. Type 1 is mildest, and life expectancy is roughly the same as for the general population. A person with type 1 OI may suffer only a few to dozens of broken bones in a lifetime. Some people with type 1, especially those with few breaks, aren't diagnosed until adulthood. Type 2 is the most severe form of OI, and patients tend to die before birth or very soon afterwards. Type 3 can also be a severe form, and many patients suffer broken bones before birth. These individuals may have dozens to hundreds of fractures during their lives, with some having an average lifespan, and others dying in early adulthood or sooner. Types 4 and 5 are intermediate. A puzzling thing about OI is that severity varies widely, even among patients with the same type --- and even among members of the same family. The reasons for these differences are not well understood. Many newer studies have argued that there are additional subtypes of OI, such as type 6, which is caused by a gene not associated with other diseases or other forms of OI (4, 5). However, a very recent paper left the classification at 5 subtypes, noting that overlap among the candidates for new subtypes (1). The classification scheme for OI doesn't seem to have been finalized, however. The Ostegenesis Imperfecta Society has a good description of the types of OI, including some beyond type 5. Overall, OI is very rare, occurring in 1 birth in 13,500 to 15,000 (reviewed in 1). This estimate doesn't include milder forms that aren't typically diagnosed until later in life. The earliest known cases of OI date to roughly 2,000 to 3,000 years ago. One was a teenaged girl who lived in the Great Lakes region of what is now Canada (6). She lived roughly 3,000 years ago and died at age ~16. She's thought to have had type 4 OI. She was short for her age, with an estimated height of 120 cm (3 feet, 10 inches). An analysis of her bones indicated that she wouldn't have been able to walk, and that use of her arms was also impaired. Another patient from the same time has been found in Egypt (7, 8). This person was an infant who was mummified and buried in Beni Hassan, an ancient cemetary. His or her leg bones were severely bowed (7). Another infant, thought to have died at birth at ~38 weeks gestation, was also found in Egypt, at Dakhleh Oasis. This child is believed to have died 2,000 years ago and had a severe form of OI. As with the the other infant, this child's legs were also bowed. Numerous fractures were also seen (9). OI 5 resembles other forms of OI and primarily affects the musculoskeletal system. Its most consistent feature is calcification (hardening) of a tissue called the interosseous membrane, or IM. The IM connects the two bones in the forearm and keeps them stable (see images at the bottom of this page). When it hardens, it loses flexibility, and a person begins to have trouble moving his lower arm. The most common problem is reduced ability to rotate the palms up and down when the arm is bent at the elbow. In a majority of cases, the defect is severe enough to cause dislocation of the head of the radius bone (see photo at right). This particular dislocation is very common in OI type 5, and is absent or uncommon in other forms of OI. Another important clinical feature of type 5 OI is the formation of calluses on bones (see photos on this page). These abnomalities are called hyperplastic calluses or hypertrophic calluses. They often form at sites where a fracture has healed, but may also form spontaneously in other places. They may cause swelling and discomfort. No one knows why they form, and they often resolve by themselves. These formations resemble tumors called osteosarcomas, and although osteosarcoma is not associated with type 5 OI, they should be investigated to ensure correct identification, especially in a person who does not have a definitive diagnosis of type 5 OI. Conversely, it may be wise to rule out osteosarcoma in a patient with bone fragility or other signs of OI. OI type 5 does not appear to affect cognitive ability/IQ. A small minority of patients have heart disease. Hearing loss and blue or grey sclerae are common in other forms of OI, but are uncommon in OI type 5. Type 5 OI is an autosomal dominant disorder caused by mutations in the gene IFITM5. The term autosomal dominant means that a disease can be passed from one affected parent to a child. Thus, many people with type 5 OI have a parent who also has the disease. When we did our literature review, we found that 40% of 105 people with OI type 5 had a parent who also had OI type 5. In the other cases, the disease occurred sporadically in a family without a history of OI. In these cases, the mutation occurred spontaneously in an egg or sperm for reasons that are not known. 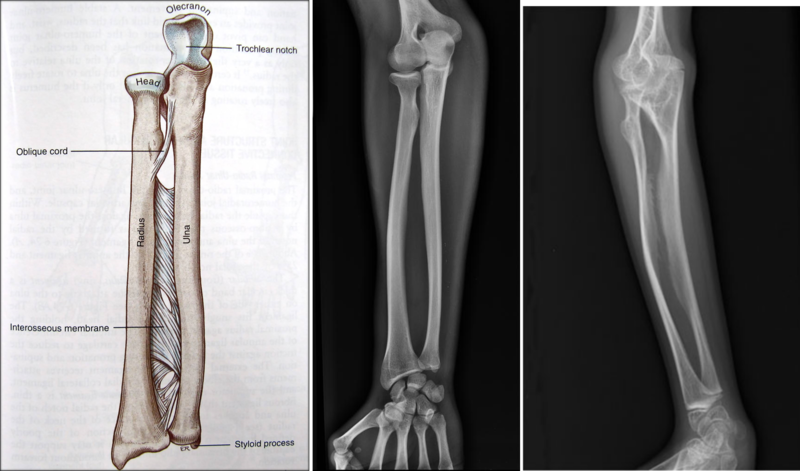 The interosseous membrane (IM) is a strip of soft tissue that connects the two bones of the arm (see photo below) and stabilizes them. The term calcification means that of this tissue is replaced by calcium. The calcium hardens the tissue, and it loses flexibility. The forearm becomes stiff and painful, and loses range of motion. 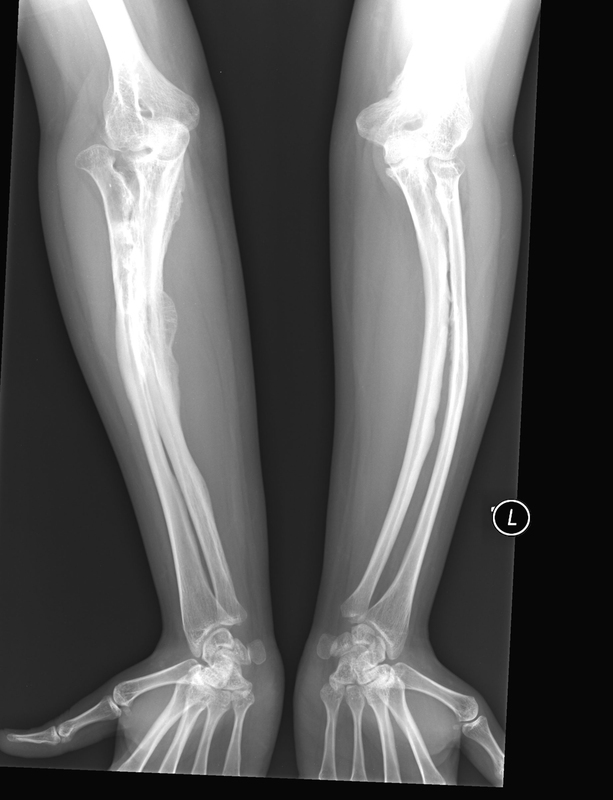 In addition, the forearm becomes less stable and dislocations can result (see photo and	X-rays on this page). IM calcification is very common in OI type 5. We found that it occurred in 91% of 137 patients, with elbow dislocations happening to ~70% of those patients. IM calcification may not always be found in very young patients, such as those under age 10 (for examples, see references 10-13). A hyperplastic callus is a hard mass of bony, fibrous, and cartilaginous tissue that develops around bones. These calluses are also calcified. They tend to occur at sites of fracture or injury in OI, but some occur elsewhere for no known reason. The X-ray images on this page show examples of hyperplastic calluses. A limb with one of these calluses can become very swollen. Important note. It is important to distinguish hyperplastic calluses from tumors and tumor-like lesions. These include osteosarcomas and osteochondromas. Although these conditions are not typically associated with OI type 5, osteosarcomas are very serious nonetheless, and should be ruled out (especially at first occurrence and most especially in a patient who does not have a definitive, molecularly confirmed diagnosis). MRI and CT scans can help distingish a callus from a sarcoma (14). The connection between IFITM5 and OI type 5 was discovered in 2012 (12, 15). Before then, people used lab testing for OI type 5 by ruling out mutations in the two collagen genes that cause most other forms of OI. Today, a diagnosis suspected on clinical features can be confirmed by finding a mutation in IFITM5. For a list of labs that perform testing, see the links at right. There are no cures for any form of OI. Doctors focus on managing OI, such as by minimizing fractures, minimizing disabilities, and helping a person live as independently as possible (16). Physical therapy is an important tool for maintaining mobility and after injuries. Medicines are also important. For example, bisphosphonates including pamidronate (11) are commonly used in OI. Bisphosphonates are drugs used to prevent loss of bone density and reduce the number of broken bones. For example, pamidronate is typically infused over the course of several years. Surgeries are also commonly used to help people with OI. For example, surgery may be used to correct curved bones or to stabilize the spine. Rods can be inserted to help support bones. Surgery can also be used to help with hearing loss. For a full discussion on managing all types of OI, see reference 10. Also, the Ostegenesis Imperfecta Society has a good summary of treatments for OI. Ideally, people with OI should have access to a diverse team of specialists who can help them. OI type 1. OI type 1 is the mildest form of OI. It is also the most common, with ~90% of OI cases classified as type 1 (5). Type I OI is characterized by bone fractures, which tend to begin around the time a child learns to walk. They become less common after puberty, but may recur after a patient has had a baby or after menopause. Fractures are rare in infants with type I OI, whereas they may even occur before birth in type 5 and other forms of OI. Other similarities between types I and V include short or very short stature, scoliosis and other problems involving curvature of the spine, bowing of the long bones, and loose or hyperexensible joints. People with OI type I tend to have blue sclerae (the whites of their eyes are blue or grey). This trait occurs in OI type 5, but is relatively rare in type 5 and relatively common in type 1. The presence of one or more of the features noted above in the Diagnosis section be the best ways to distinguish OI type 5 from type 1 clinically. Genetic testing can give	a definitive answer, as OI type 1 is caused by mutations in either COL1A1 or COL1A2. OI type 4. This subtype of OI is called the moderate form, though disease severity varies from being relatively mild (only a few fractures over the course of a life) to severe (fractures present at birth). In this sense, types 4 and 5 overlap. In addition, people with OI types 4 and 5 may also have similar facial features (a triangular face and a prominent forehead, for example) and abnormal spinal curvature. However, there are key differences between the two conditions. Many people with OI type 4 have a dental condition that makes their teeth brittle and discolored. This condition is called dentinogenesis imperfecta. It does not appear to be a feature of OI 5 --- for example, in our reivew, no one among 132 cases reporting on this problem had it. In addition, people with OI type 4 do not have calcification of the interosseous membrane. Testing for genetic mutations can distinguish the two conditions, as OI 5 is caused exclusively by mutations in IFITM5. Type 4 OI is associated with a number of genes, including COL1A1, COL1A2, CRTAP, PPIB, FKBP10, SERPINF1, and WNT1. OI type 3. This subtype of OI is called the progressively deforming form. Overall, it is more severe than type 5 OI, although the level of bone fragility varies widely. Some newborns with type 3 OI have multiple bone fractures, and they may have respiratory troubles and difficulty swallowing. Adults tend to be very short (less than 42 inches). As with type 4 OI, dentinogenesis imperfecta is common, and if it is present, it is an indicator that the patient does not have type 5 OI. Bone malformation tend to get worse with time in this form of OI, which is why it is called the progressively deforming form. In particular, the long bones of the arms and legs and the ribs become deformed. Many patients require wheelchairs. Most cases of type 3 OI are caused by mutations in COL1A1 or COL1A2, but 13 other genes are also associated with type 3. OI type 2. This form of OI is the most severe form. Patients with type 2 OI do not generally survive longer than a few weeks, and many die before birth or around the time of birth. OI Death is usually due to respiratory and cardiac problems. Patients with OI types 2 and 5 may develop fractures before birth, but are caused by different genes. In contrast, life expectancy in type 5 is higher, with some patients in our literature survey being in their 40s and 50s. Given that the condition was first described only in 2002, it is not possible to make predictions about survival past those ages. 1. Tournis S & Dede AD (2017) Osteogenesis imperfecta - a clinical update. Metabolism 80:27-37. Abstract on PubMed. 2. Sillence DO et al. (1979) Genetic heterogeneity in osteogenesis imperfecta. J Med Genet 16(2):101-116. Full text on PubMed. 3. Glorieux FH et al. (2000) Type V osteogenesis imperfecta: a new form of brittle bone disease. J Bone Miner Res 15(9):1650-1658. Full text from publisher. 4. Glorieux FH et al. (2002) Osteogenesis imperfecta type VI: a form of brittle bone disease with a mineralization defect. J Bone Miner Res 17(1):30-38. Full text from publisher. 5. Homan EP et al. (2011) Mutations in SERPINF1 cause osteogenesis imperfecta type VI. J Bone Miner Res 26(12):2798-2803. Full text on PubMed. 6. Vairamuthu T & Pfeiffer S (2018) A juvenile with compromised osteogenesis provides insights into past hunter-gatherer lives. Int J Paleopathol. 20:1-9. Full text from publisher via PubMed. 7. Gray PHK (1970) A case of osteogenesis imperfecta, associated with dentinogenesis imperfecta, dating from antiquity. Clin Radiol 21(1):106-108. Abstract on PubMed. 8. Lowenstein E (2009) Osteogenesis imperfecta in a 3,000-year-old mummy. Childs Nerv Sys 25(5):515-516. Abstract on PubMed. 9. Cope DJ & Dupras TL (2011) Osteogenesis imperfecta in the archeological record: an example from the Dakhleh Oasis, Egypt. Int J Paleopathol 1(3-4):188-189. Abstract on PubMed. 10. Kim OH et al. (2013) Osteogenesis imperfecta type V: clinical and radiographic manifestations in mutation confirmed patients. Am J Med Genet A 161A(8):1972-1979. Abstract on PubMed. 11. Liu Y et al. (2016) Osteogenesis imperfecta type V: Genetic and clinical findings in eleven Chinese patients. Clin Chim Acta 462:201-209. Abstract on PubMed. 12. Semler O et al. (2012) A mutation in the 5'-UTR of IFITM5 creates an in-frame start codon and causes autosomal-dominant osteogenesis imperfecta type V with hyperplastic callus. Am J Hum Genet 91(2):349-357. Full text on PubMed. 13. Zhang Z et al. (2013) Phenotype and genotype analysis of Chinese patients with osteogenesis imperfecta type V. PLoS One 8(8):e72337. doi: 10.1371/journal.pone.0072337. Full text on PubMed. 14. Renaud A et al. (2013) Radiographic features of osteogenesis imperfecta. Insights Imaging 4(4):417-429. Full text on PubMed. 15. Cho TJ et al. (2012) A single recurrent mutation in the 5'-UTR of IFITM5 causes osteogenesis imperfecta type V. Am J Hum Genet 91(2):343-348. Full text on PubMed. 16. Steiner RD et al. 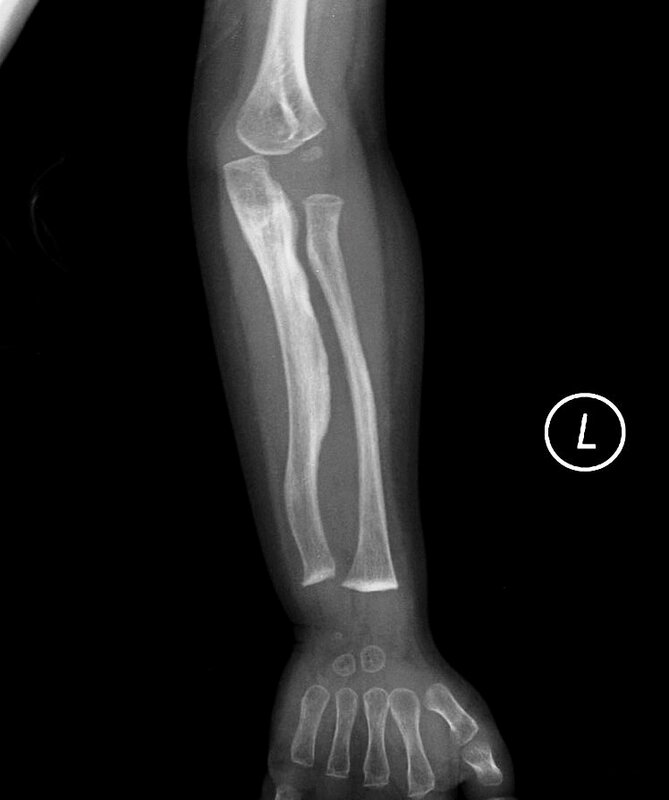 (2005) COL1A1/2-related osteogenesis imperfecta. Updated 14 February 2013. GeneReviews [Internet] Pagon RA et al., editors. Seattle (WA): University of Washington, Seattle; 1993-2018. Full text. 17. Blouin S et al. (2017) Hypermineralization and high osteocyte lacunar density in osteogenesis imperfecta type V bone indicate exuberant primary bone formation. J Bone Miner Res 32(9):1884-1892. Abstract on PubMed. 18. Lazarus S et al. (2014) A brilliant breakthrough in OI type V. Osteoporos Int 25(4):399-405. Abstract on PubMed. 19. ShakataGaNai, Wikimedia Commons user (2017) Photograph on the Wikimedia Commons. 20. Fujino T et al. (2010)Sporadic osteogenesis imperfecta type V in an 11-year-old Japanese girl. J Orthop Sci 15(4):589-593. Abstract on PubMed. 21. 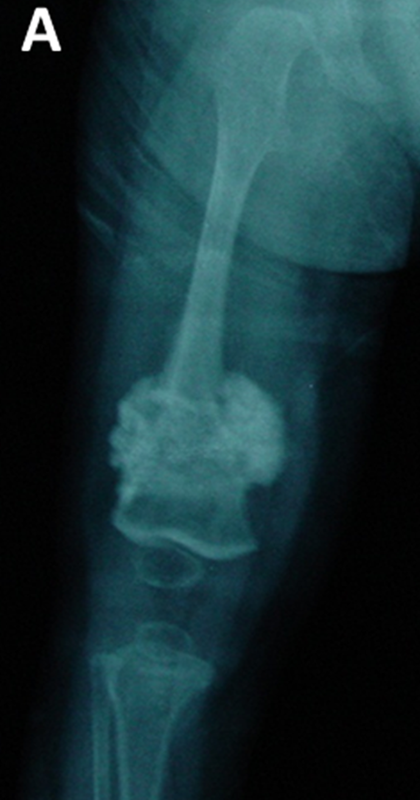 Patel MS, Radiopedia contributor (no date given) Image of forearm with abcess. Image and case history on the Radiopedia. 22. ShakataGaNai, Wikimedia Commons user (2017) Photograph on the Wikimedia Commons. 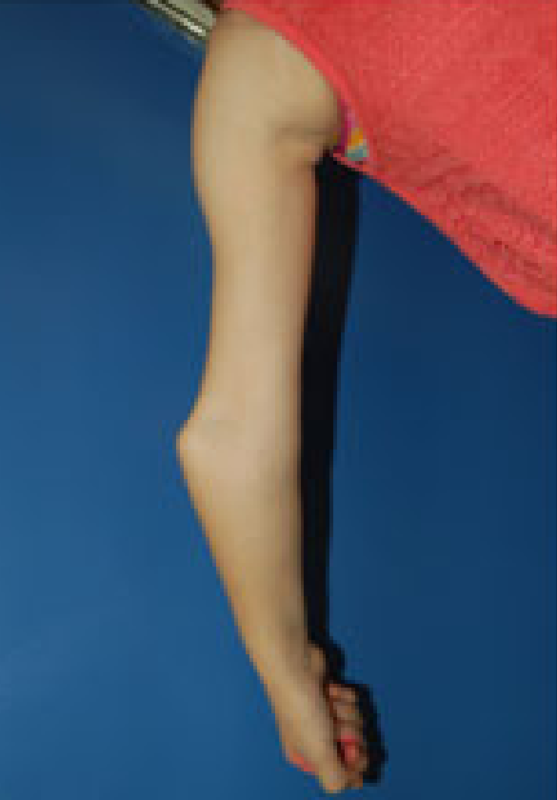 Above: A girl with OI5 and a dislocated elbow (18). Below: A hyperplastic callus in OI5 (13). bowing of the long bones, and a hyperplastic callus (left, where the bone is most rounded. head is also shown in the picture (top left). Below middle: X-ray showing a forearm with a normal interosseous membrane (21). Below right: X-ray showing calcification of the interosseous membrane. See reference 20. For a larger image and copyright information, click here. arrow shows the location of the fracture. Source: reference 10.